Agile is enjoying broad appeal as a way to drive speed and innovation. The business rationale is clear, but achieving full system optimization for Agile projects requires a culture change and a new mindset for IT, the PMO and the business. And your senior leaders will need to Sponsor these projects differently, too! 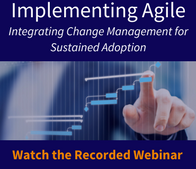 In this engaging, one-hour webinar Don Harrison provides answers to common questions on exactly how to become an Agile organization.